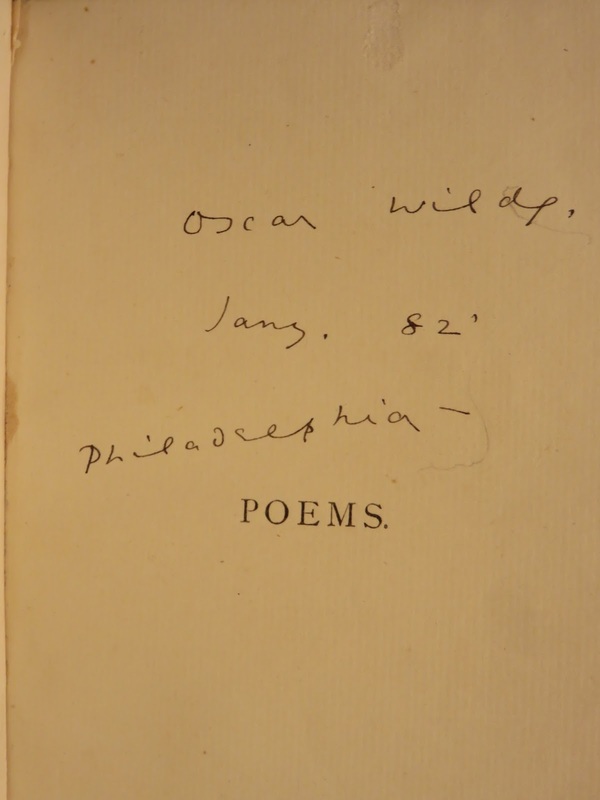 In last week's blog - No 351 Ricketts's Design of Oscar Wilde's Poems (1892) (3) - I have shown a scan of the lower part of the title page of Poems (1892). This page is part of a bifolium, four pages, of which only one is typeset (the half title). The last page is left blank, the second and third pages contain the limitation statement and the title page and these two have been reproduced after an original drawing by Ricketts. The bifolium has been pasted in at the front, before the other gatherings. Ricketts's hand-lettering was slightly reduced in size, as usual for relief blocks, minimizing the space between some lines in the limitation statement, and on the title page. The printing of the block has left traces in some copies of Poems. Next to the place name 'London', slightly to the left, a faint ink circle can be seen. This was not intended. When the zinc plate was ready for use, it was mounted on wood to the height of the type, and this was done with small nails. 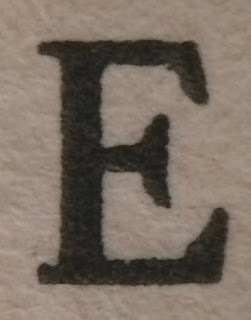 The head should remain below the inking surface, but the faint ink circle on the title page testifies that this wasn't always properly taken care of, causing the head of the nail to catch ink and print it on the paper. 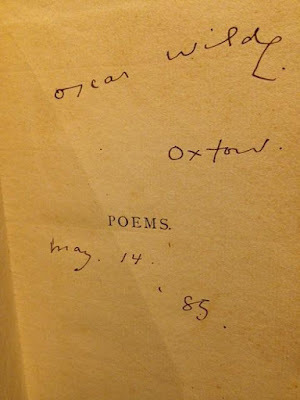 When the remaining sheets of Oscar Wilde's Poems, published in 1881-1882 (sheets of the second printing, used for the fourth and fifth 'editions') by David Bogue, were used for the new 'edition' by Elkin Mathews and John Lane | At The Sign of The Bodley Head in 1892, quire Q with the list of Bogue's publications was cut out. Also, the first two preliminary leaves were discarded. The original pages contained (1) a half-tile, (2) a blank page, (3) title-page, (4) name and address of the printer. One leaf (4 pages). Charles Ricketts was asked to design the new preliminary pages, new endpapers and a new binding. For the first four pages, he designed a title-page and a facing limitation statement. 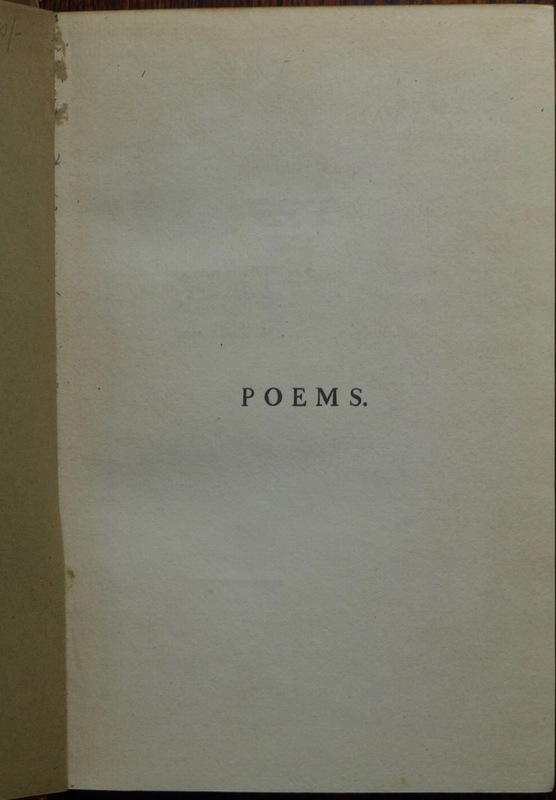 The verso of the title page is blank. The recto of the first page contains the half-title. Or, in other words: (1) half-title, (2) limitation page, (3) title-page, (4) blank. One folded leaf, pasted in at the front. Did Ricketts actually design the half-title, as is stated by Wilde's bibliographer Stuart Mason (Christopher Sclater Millard)? 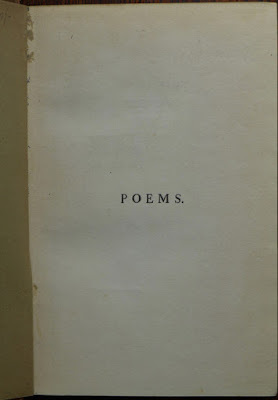 The thing is, the half-title in the 1892 edition is almost identical to the one in the first edition of Poems, and the type used seems almost the same, including the dot after Poems. Apart from this typographical similarity, it is to be noted that this is the only page for which any typesetting had to be done. The other pages are reproduced after drawings by Ricketts. The lettering of those pages is not type-set, but originally drawn by hand, and slightly reduced in size for the block, as was the custom with illustrations. Even the place name, outside the double border, has been hand-lettered. 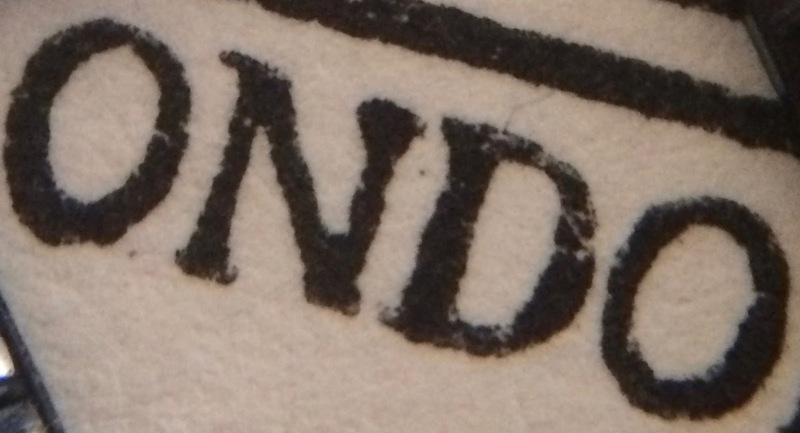 The two 'n's and 'o's in London are not identical (as can be seen with a magnifier). Using a magnifier for the word 'Poems.' on the half-title, we see a very regular type. Advertisements for the book mentioned that the book had been printed at the Chiswick Press, 'with decorated title-page and end-papers, the binding "The Seven Trees," in gold on Iris cloth; designed by C.S. Ricketts'. The half-title isn't mentioned by the publisher in his letters to Wilde. However, Mason simply assumed that Ricketts designed the four new pages. My inclination is to believe otherwise. Firstly, had Ricketts designed the half-title, a more interesting page would have been designed for which another block would have had to be made. 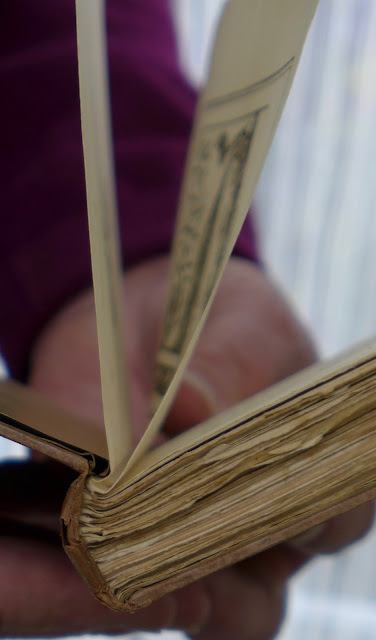 The artist knew that the publisher wished to produce a limited edition book without spending too much. Rickets usually was very economical and resourceful when it came to meet the needs of publishers. Secondly, the new half-title is not hand-drawn but typeset, and thus different in approach in comparison with the other preliminary pages. Thirdly, the new half-title so much resembles the older one, that it can be assumed that the printer was commissioned to imitate the 1881-1882 half-title, and duly did so. The printer of this new sheet is not identified. However, a half-title was a matter of custom, and it may have been a printer's initiative to include it. Moreover, this was the cheapest solution. Printers and binders needed half-titles to accommodate the workflow. For the publisher, the half-title wasn't an important page. Why bother an artist like Ricketts for a special design for such a plain page that wasn't seen as the real entrance to the book? 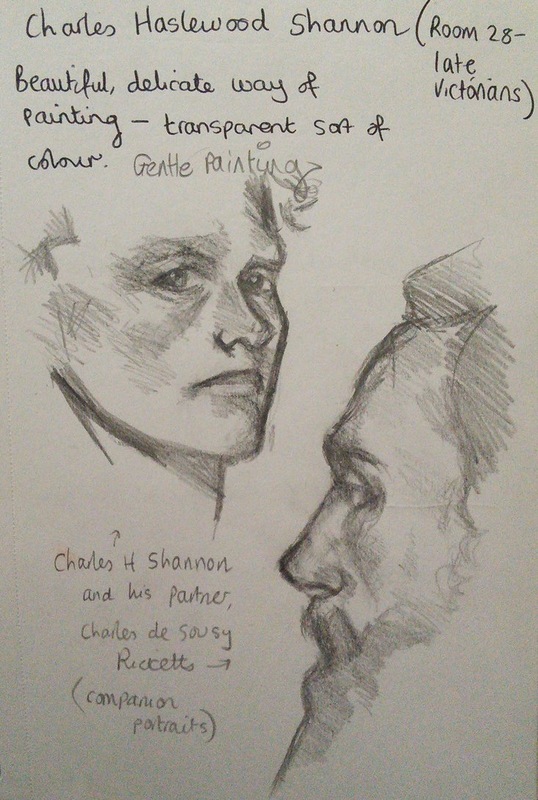 The two paintings of Shannon in the National Portrait Gallery - Shannon's self-portrait and his portrait of Ricketts - seem to inspire contemporary artists. I found a recent double portrait on a site called 'Deviant Art'. I couldn't contact the visual artist who posted this drawing, so I hope she doesn't mind my reproducing it here. The comments are about his style: 'Beautiful, delicate way of painting - transparent soft of colour. Gentle painting'. The drawing - by an art student? - is published on the site by 'Pumpkin-Pasty', or 'Rosie', who is, according to her tags, interested in traditional painting, drawings, portraits & figures. Fifty-eight years ago, one of the first exhibitions on Art Nouveau was on view at The Museum of Modern Art in New York. 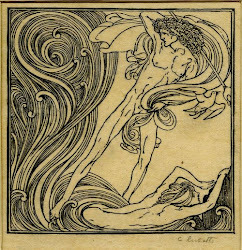 The catalogue Art Nouveau. Art and Design at the Turn of the Century, edited by Peter Selz and Mildred Constantine, duly mentioned that this show had been preceded by a small exhibition on Art Nouveau in the same museum as early as 1933. 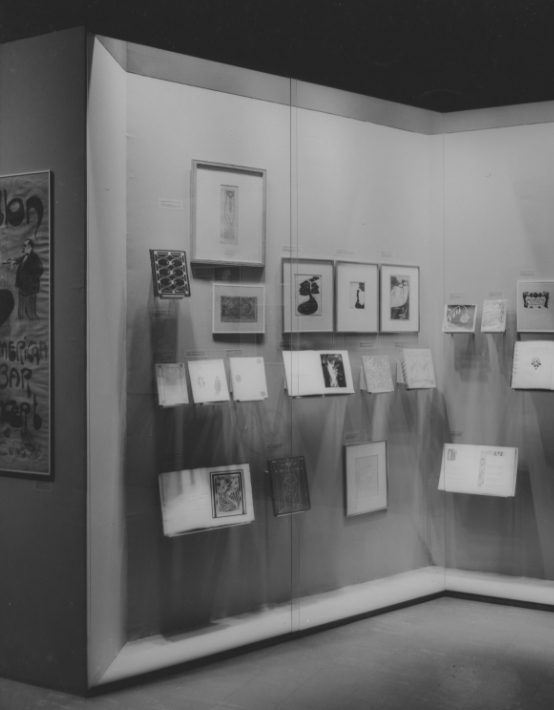 By 1960 scholars and collectors had accumulated enough material for a large exhibition. A photograph from 1960 shows a wall with books and prints, and one can easily recognize some Aubrey Beardsley illustrations, but also, to the left, on the second row from the bottom, two books designed by Charles Ricketts. Both books were closed, and only the front cover of these could be admired. To the left is a copy of Hero and Leander (1894) from the collection of Mr and Mrs Leonard Baskin (Northampton, Massachusetts). To the right is Wilde's The Sphinx (1894), the Morgan Library copy. Nice to know that illustrator, sculptor and book artist Leonard Baskin (1922-2000) and his wife nature writer Esther Tane Baskin (1925-1973) had a copy of Hero and Leander.